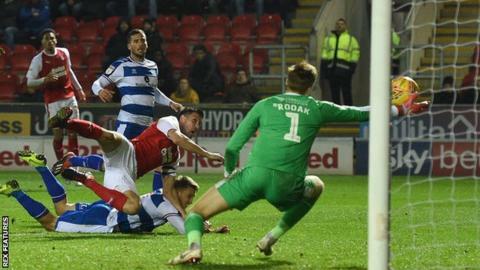 A diving header from Luke Freeman in stoppage time earned Queens Park Rangers a point against Rotherham United. Will Vaulks' clean strike from just outside the box gave hosts Rotherham the lead before QPR front man Nahki Wells equalised when the Millers failed to clear their lines. Paul Warne's side then immediately restored their advantage when Clark Robertson guided a free header into the back of the net from a Vaulks free-kick. But as the final whistle approached, Steve McClaren's side bombarded the Rotherham box and levelled when winger Freeman headed past a diving Marek Rodak at the near post. During the onslaught, QPR had two penalty shouts waved away by referee Andy Woolmer after Eberechi Eze and Joel Lynch believed they had been fouled. Pawel Wszolek had a golden opportunity to score around the hour mark, but was unable to connect with Freeman's inviting cross in front of goal. Rodak kept Rotherham in the lead with two great saves to deny Eze and substitute Tomer Hemed in the dying minutes before their defence was eventually breached. But immediately after the equaliser, Rodak's opposite number Joe Lumley pulled off a excellent save to prevent Jamie Proctor's late-gasp strike snatching the points. The Millers have now drawn eight out of their past 10 games and remain unbeaten at home since August. "The bench made a difference and that is what we need. It is not about the XI but the squad and we need to continue that. Match ends, Rotherham United 2, Queens Park Rangers 2. Second Half ends, Rotherham United 2, Queens Park Rangers 2. Attempt missed. Joe Mattock (Rotherham United) header from the centre of the box misses to the left. Attempt saved. Jamie Proctor (Rotherham United) right footed shot from the centre of the box is saved in the bottom right corner. Assisted by Michael Smith with a cross. Attempt saved. Will Vaulks (Rotherham United) right footed shot from outside the box is saved in the centre of the goal. Assisted by Richard Towell. Goal! Rotherham United 2, Queens Park Rangers 2. Luke Freeman (Queens Park Rangers) header from the centre of the box to the top left corner. Assisted by Jake Bidwell with a cross. Attempt saved. Josh Scowen (Queens Park Rangers) right footed shot from the centre of the box is saved in the bottom left corner. Assisted by Matt Smith with a headed pass. Substitution, Rotherham United. Jamie Proctor replaces Ryan Williams. Corner, Queens Park Rangers. Conceded by Clark Robertson. Corner, Queens Park Rangers. Conceded by Marek Rodák. Attempt saved. Eberechi Eze (Queens Park Rangers) right footed shot from the centre of the box is saved in the top centre of the goal. Attempt missed. Angel Rangel (Queens Park Rangers) left footed shot from outside the box misses to the right following a corner. Attempt saved. Luke Freeman (Queens Park Rangers) left footed shot from the centre of the box is saved in the top right corner. Assisted by Tomer Hemed. Attempt saved. Joe Mattock (Rotherham United) right footed shot from the centre of the box is saved in the centre of the goal. Attempt missed. Semi Ajayi (Rotherham United) right footed shot from outside the box is just a bit too high. Assisted by Richard Towell. Foul by Zak Vyner (Rotherham United). Substitution, Queens Park Rangers. Josh Scowen replaces Massimo Luongo. Substitution, Queens Park Rangers. Matt Smith replaces Nahki Wells. Attempt missed. Richard Wood (Rotherham United) header from the centre of the box is too high. Assisted by Joe Newell with a cross following a corner. Attempt blocked. Richard Towell (Rotherham United) right footed shot from outside the box is blocked. Assisted by Semi Ajayi. Attempt missed. Tomer Hemed (Queens Park Rangers) right footed shot from the centre of the box is close, but misses to the left. Assisted by Massimo Luongo following a set piece situation. Substitution, Rotherham United. Richard Wood replaces Matthew Palmer. Substitution, Queens Park Rangers. Tomer Hemed replaces Pawel Wszolek. Nahki Wells (Queens Park Rangers) wins a free kick in the defensive half. Attempt missed. Luke Freeman (Queens Park Rangers) left footed shot from outside the box misses to the right following a set piece situation. Luke Freeman (Queens Park Rangers) wins a free kick on the right wing.